The Phantom is a large bike that appears in Mario Kart Wii. This bike does not feature a kart counterpart. In fact, no other kart has stats similar to this bike's stats, but the Phantom's stats are similar to that of the medium-sized Zip Zip bike. The Phantom can be unlocked by winning the Mirror Special Cup. The Phantom features exactly average Mini-Turbo. Its best stat is the off-road stat, which is both the best of all large vehicles, as well as the same as that of the Dolphin Dasher and Bit Bike. Its handling, weight, speed, and acceleration are also good. However, the bike suffers from the worst drifting in the game and drifts outwards, making it rather difficult for beginners to control. This is unusual, as bikes typically have better drift than karts, but at the same time, the Phantom lacks a kart counterpart. Compared to the Zip Zip, the Phantom is slightly faster and heavier, but it has slightly worse handling, acceleration, offroad, mini-turbo, and drift. The Phantom is also one of the lighter large bikes, as it's only heavier than the Shooting Star, and its weight is tied with the medium-sized Wild Wing kart. "Most of the Phantom's stat categories are in the winning column. When you can hold your own in a Kart mash-up and pull away quickly with Mini-Turbos & Acceleration power, you've got a strong winner!" 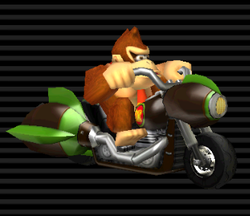 Donkey Kong drove this bike during the first August 2008 tournament. The Phantom is one of six vehicles in Mario Kart Wii to go through a design change other than a palette-swap, the others being the Bit Bike, Flame Runner, Wario Bike, Shooting Star, and Spear. In this case, Rosalina's Phantom has its foot pedestals positioned further, and its center is slightly thinner in appearance. Also, Bowser's and Dry Bowser's Phantom have their handles positioned lower than the others. The Phantom has the same speed stat as the Magikruiser and the same weight stat as the Wild Wing. The Phantom is the only large vehicle, besides Dry Bowser riding the Wario Bike, that can drift off-road. If Dry Bowser rides the Phantom, its off-road will tie with the Zip Zip's default off-road. This page was last edited on March 8, 2019, at 16:15.